Home » DreamWoven - A Taste of Different » Choose Your Attitude - Attitude Hat by DreamWoven - "LOOP"
Choose Your Attitude - Attitude Hat by DreamWoven - "LOOP"
Attitude hat - "LOOP" - Winter Version - Right Hat Only The Hat with Attitude. This is one of the original Attitude designs.... long, warm and funky. Perfect for fall and winter. 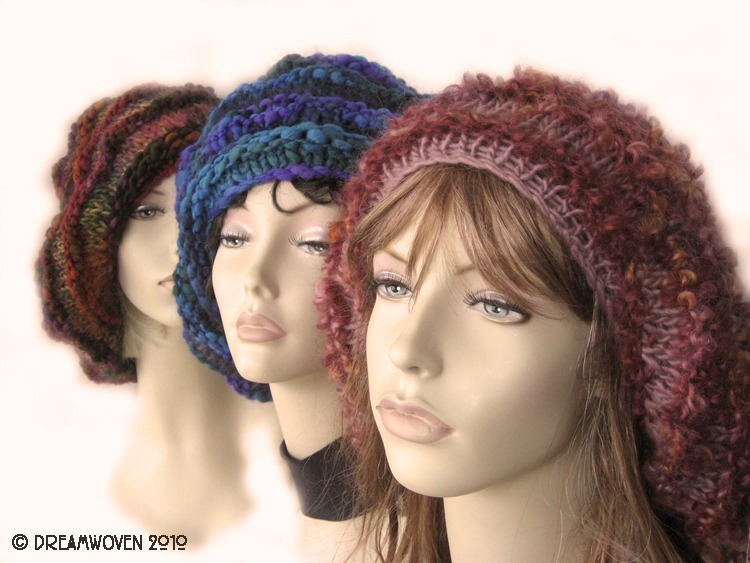 Casual and sassy, Great for those with dreads, as well as those without, perfect for a bad-hair day. Have fun - that's what it's all about..... Don't try to hide though, because with this hat you will be found! This Attitude Hat is full soft colour. Blushes of fall leaves...with large lusty loops. This is insanely beautiful stuff, exquisitely hand dyed and then handknit by me. It is a combination of wool and mohair. It's your Attitude to fit your mood! The opening measures approx. 13" when laid flat and approx. 15" when stretched out. Because of its construction, it can be worn by a variety of head sizes. Please measure your head by using a measuring tape around your crown, going around the largest part of your head. For reference only, the mannequin head circumference is 21". The only pre-requisite to wearing this hat is that you do it with ATTITUDE! **The other hats are available as separate listings. I use Priority Mail. Shipping price includes insurance.